A Soyuz rocket delivered successfully on Friday a three-man crew to the International Space Station (ISS). The Russian rocket departed from the Baikonur Cosmodrome in Kazakhstan at 9:41 p.m. local time, kicking off the six hours long trip to the ISS. 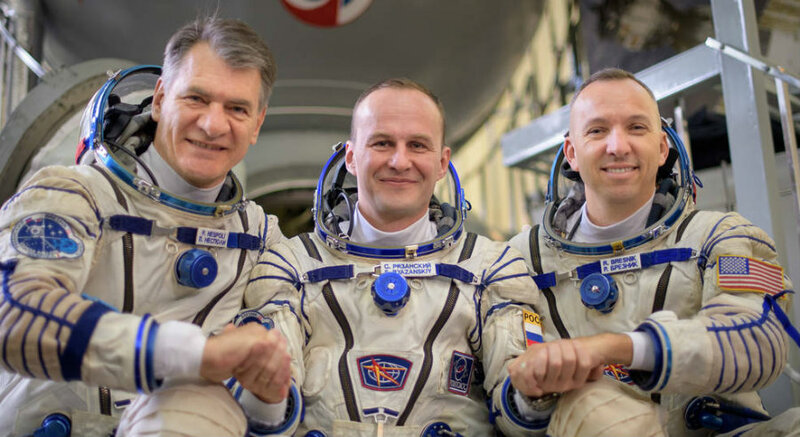 A fresh crew arrived at the orbiting space lab: Russian cosmonaut Sergey Ryazanskiy, NASA flight engineer Randy Bresnik, and Italian astronaut Paolo Nespoli from the European Space Agency. Ryazanskiy served as commander of the Soyuz MS-05 spacecraft. The ISS is now host of six crew members, all of whom will engage in research and experiments in the American part of the orbiting laboratory. Commander Ryazanskiy has already spent some time orbiting Earth since he spent 166 days aboard the ISS between 2013 and 2014. Ryazanskiy also commanded one of three international crews during a simulated 500-day Mars mission in 2009. He has a doctorate in biomedicine and is the first scientist-cosmonaut to serve as a Soyuz commander. “Sergey is the first scientist-commander of the Soyuz and with his Mars experience and just the good character of the person he is, he’s been an outstanding commander for us to prepare our flight,” said Bresnik, according to CBS News. Bresnik is an F/A-18 TOPGUN pilot with over 6,000 hours of flying time in high-performance aircraft. He has also spent ten days in a space shuttle crew member during a space station assembly mission in 2009. Nespoli -who’s already a space veteran- just embarked on his third spaceflight and will add some days in orbit to his 174-day long. The new crew members were greeted by Expedition 52 Commander Fyodor Yurchikhin of Roscosmos, as well as NASA’s flight engineers Jack Fischer and Peggy Whitson. The Soyuz MS-05 orbited Earth four times before docking at the space station. Space Coast Daily reports that after standard pressurization and leak checks, the hatches between the Soyuz and the ISS were opened. The new Expedition 52 members will spend about four months together conducting nearly 250 science investigations in fields such as human research, biology, physical sciences, Earth science, and technology development. The ISS crew usually is evenly split between the Russian cosmonauts and the U.S. segment, which includes astronauts from NASA, the European Space Agency, Japan, and Canada. However, Roscosmos recently announced it would reduce its crew complement to save money, which opened up an additional Soyuz seat for USOS (U.S. orbital segment) astronauts. Fischer, who’s been stationed in the ISS since April, also shared his excitement about having a fourth team member. He told CBS News that having four people up there is “crazy talk” and that he was super excited about how much science they’re going to be able to get done will all of the new crew members. Bresnik agreed with Fischer, and called the USOS crew a “huge improvement.” He said in a press conference that they would get a taste of that improvement when they arrived at the ISS because he and Nespoli will be up there with Fischer and Whitson, who have been working by themselves in the U.S. segment since June. Ryazanskiy, on the other hand, said having only two Russian cosmonauts aboard the ISS will require some research to be carried in their spare time, but he doesn’t believe they’ll come across any problems. The three new crew members will have some exciting first weeks aboard the ISS, as a SpaceX Dragon cargo ship is scheduled to arrive in a couple of weeks, the Russian cosmonauts have a scheduled spacewalk on August 17, and a solar eclipse will be photographed from the station on Aug. 21. Yurchikhin, Fischer, and Whitson are expected to remain aboard the orbiting lab until September. Shortly after they return Earth, NASA astronauts Mark Vande Hei and Joseph Acaba, as well as Russian cosmonaut Alexander Misurkin, will join the Expedition 53 crew. Ryazanskiy, Nespoli, and Bresnik are scheduled to return in December.